Hand Analysis Online: Obama's Hands - Are we all in good hands? We're living in exciting times! America’s in new hands and the rest of the world it. But who is this man we’re embracing? What do we know about the hands that hold all our hopes and dreams? Hands don’t lie. Hands speak volumes about their owners. Our strengths, weaknesses, challenges and even deepest motivators are visible in our palms. Obama has a big task ahead of him. Can he get the job done? Is he a good team player? Will he take the resto fthe world into consideration? Will he be able to navigate America through choppy seas? So what do Obama’s hands say? The set of Obama’s thumb indicates that he is a good team player. This is good news for the rest of the world. He is likely to work with other countries and other factions for the good of all. The deep long line running under his middle finger is the hallmark of a highly responsible person. This line indicates a capacity and willingness to work. He gets the job done! His ‘trains all run on time’. This is good news in a president’s hands. He’ll lead by doing. Other good news is his headline type. He has a very special headline type called a HAL. This long headline that runs almost to the edge of the palm but not over it is a giftmarker indicating that he is built to solve world scale problems. So, he certainly has the perfect brain for the job. But what about his heart? The long upward sweep of his heart line towards the middle finger indicates a passionate, expressive communication style. Obama has fire in his heart! He knows what he wants and isn’t shy to express his needs. Fortunately he also has rounded tips to his fingers indicating a cheerful, friendly disposition and a desire to please others. He also has a very healthy gap between his headline and lifeline. This means he is an independent thinker. His thinking is not bound to that of his family of origin. 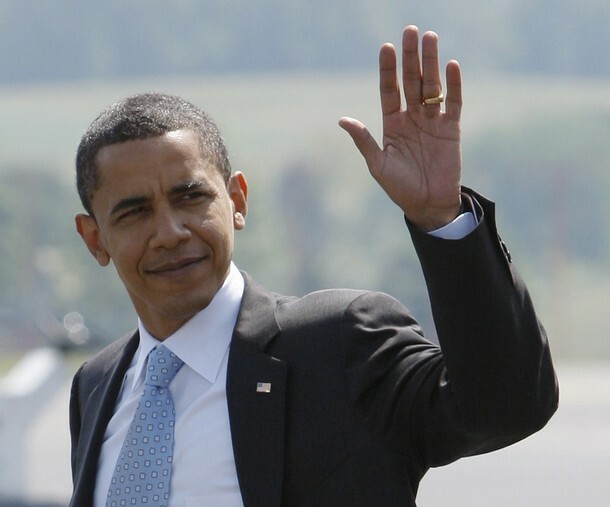 Obama has a relatively low set index finger. This means he feels he doesn’t always get the respect he deserves. Quite understandable given his background. But can he overcome this? I think so. Obama has a relatively long hand with long fingers. This indicates an interesting blend of thoughtfulness and sensitivity. He can think objectively about feelings without reacting blindly. Good qualities for hands that hold so much power. What drives Obama? Obama has a very high set ring finger. This means that he thrives on applause and being in the spotlight. It’s a fundamental need. The worst thing you could do to this man is ignore him. Hardly likely considering that he is now most powerful man on this planet! The other thing that drives Obama is his fundamental need to solve world scale problems. Overall, this is a good hand for a peace maker and a leader. Both strong and sensitive, he can see the broader picture, hold a vision, lead powerfully and at the same time connect with others, considering their needs and opinions. It's an intoxicating mixture (charisma, passion, fairness, staying power and intelligence). Perfect for the man who will lead the world into a new era of peace and mutual prosperity.